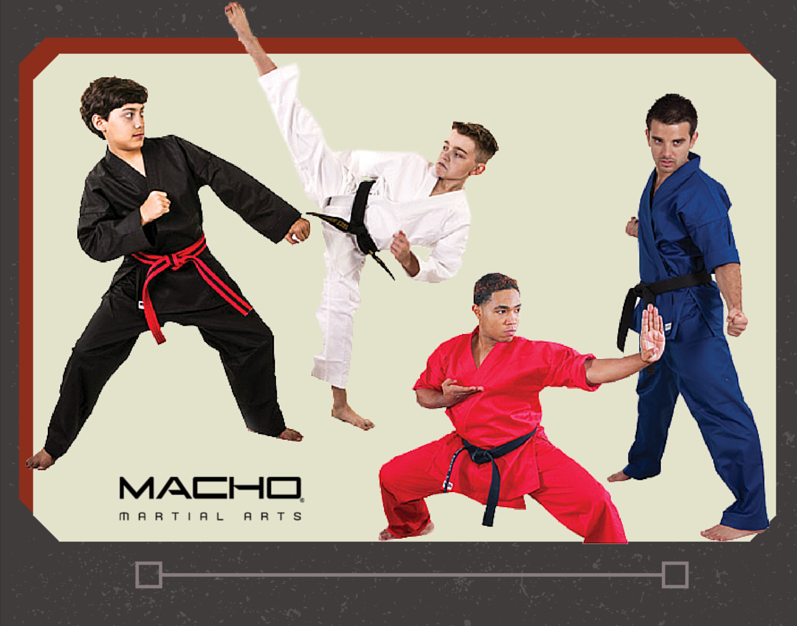 How to make sure you’re purchasing the right Gi - The Macho Blog. What size should I buy? What weight? What color? What style? The questions can go on and on. Purchasing a gi seems like a daunting task. Uniforms are a vital part of martial arts training, so getting the right one is important. We understand. We want to take away the confusion and instill confidence in its place. Use this guide to help you along your uniform purchasing journey. What Style Do I Pick? The first thing you may be wondering is whether or not there is a difference between the uniform types. The answer is yes; there is difference. The one you should go with depends on what form of martial arts you are practicing. Karate and Tae Kwon Do uniforms are a lot lighter than Jiu Jitsu Gis and usually weigh around 8 oz. They get their lightness from the limited stitching around the sleeves and collar and from the thin, straight, and tightly woven cotton or cotton/polyester blend fabric they are constructed from. The biggest difference is that Karate uniforms have tie straps in the inside of the jacket. This ensures the jacket will not fly off during intense striking and kicking. The karate uniform has been maximized for a more limited range of movement. It was designed to stay in place during standing strikes, while maximizing speed through its lightness. A Jiu Jitsu, BJJ, and Judo uniform is heavier and has been optimized for the intense movement involved in gripping, pulling, and turning. The tough weave reduces tangling with limbs and is easier to grapple with. Unlike a Karate Gi, a Jiu Jitsu, BJJ, and Judo Gi do not have tie straps on the inside. Ties would be too easily torn off from the intense pulling and twisting movements involved in practicing these martial arts. Most traditional styles are white, but with the wide selection of colors available out there, you may be tempted to explore your color options. The safest thing to do is talk to your instructor first. A lot of schools have specific colors they want you to wear. Your instructor will let you know your school’s color guidelines. When we talk about weight, we mean how heavy a uniform is; weight is not the same as size. Personal preference comes in to play when choosing the weight of your gi. There are many factors that influence a martial artist’s weight preference. Students often prefer a lightweight uniform, weighing around 8 oz. This weight helps students get comfortable with practice. They can get used to movements without being distracted by a super thick and heavy uniform. A heavyweight gi is great for martial artists competing in tournaments or for more advanced students. The heavyweight gi has a more traditional thick fabric construction and a lot more stitching around the sleeves and lapel. This extra stitching and weight gives the uniform a great “POP” during movement. That satisfying snap is important to many martial artists as it can add energy and a feeling of power to strikes. The most important factor in purchasing your gi is fit. So how do you know what size will fit you best? There are three major measurements to take into account: height, weight, and circumference. 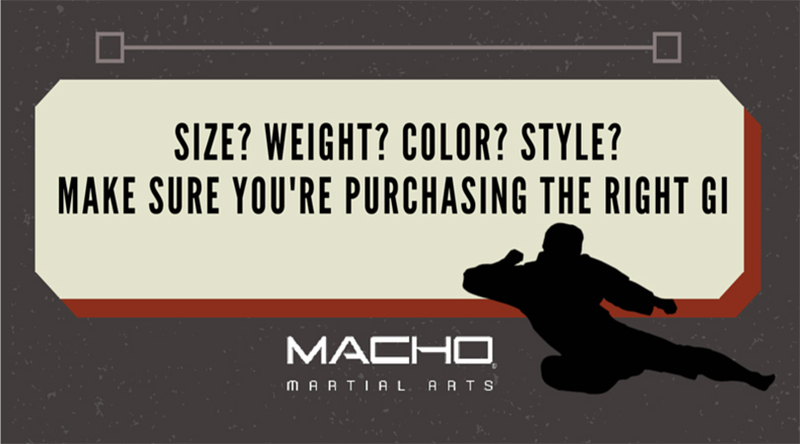 Take these three numbers and compare them to the sizing charts available throughout the Macho website. Are you tall and thin? Or short and stout? There is a trick to helping you find a size that will best fit your unique shape. The most important thing to consider is height. 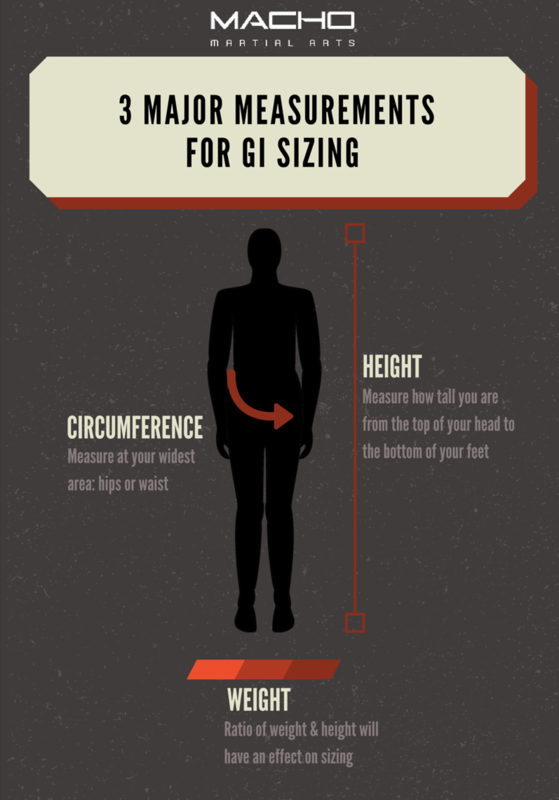 Most gis provide room to fit your circumference and weight despite the size, but if it’s too long or too short, then it won’t work for you. You don’t want to be swimming in sleeves that are too long, so always accommodate height first!